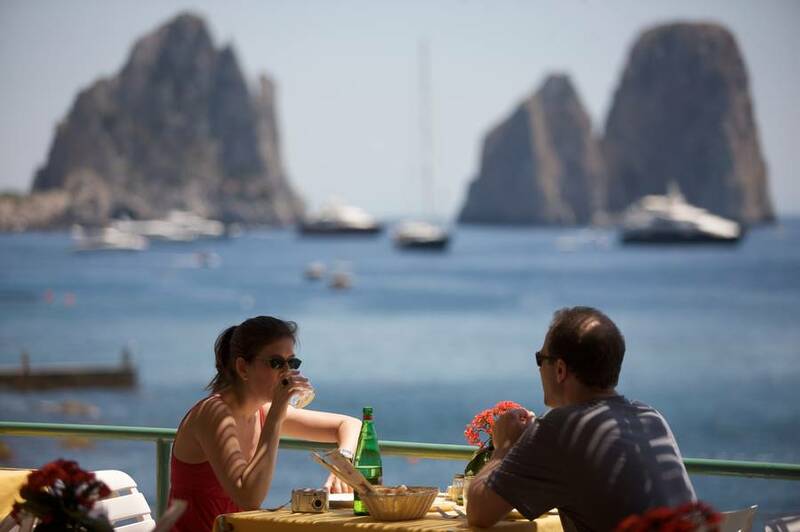 If you are planning a quick stay of one or two nights on Capri, you may be wondering how much you should budget for meals, accommodations, and sightseeing. To be honest, not even I was sure how much to budget for a short break on Capri, though I was born and still live in Sorrento, just 20 minutes away by ferry. Though I can virtually see the island from my house, I had never stayed overnight there because, let's be honest, Capri is not a particularly budget-friendly destination. Let's say that you are a couple travelling, and you want to take a day or two out from a summer trip to southern Italy to relax at the seaside and visit some of the sights on the island of Capri. Here's a quick guide to how much you can expect to spend, both for those on a very tight budget and those who can splurge a bit. In both cases, we've budgeted for a simple B&B in Anacapri. If you visit in the off-season (before or after July and August), you'll find lower hotel costs (you can even find rooms for EUR 60 a night), or if you want to splurge, you can choose a luxury hotel in the center of Capri town.